College Sports' Old Rivalries Succumb To New Money There are just two weeks until Selection Sunday, the day the teams and seeds of the NCAA basketball tournament are announced. By then, three pairs of age-old rivals will have squared off in what may be their last games ever. Kansas fans celebrate during the second half of an NCAA college basketball game against Missouri in Lawrence, Kan., on Saturday. 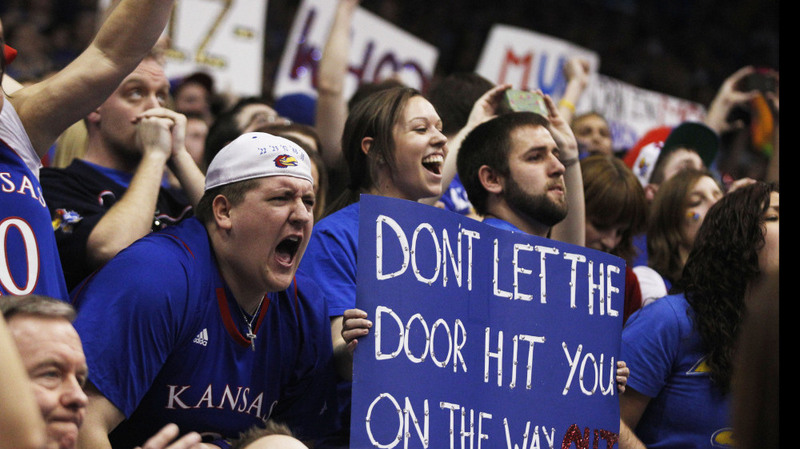 Kansas defeated Missouri 87-86 in overtime. The Kansas Jayhawks staged a dramatic comeback Saturday to defeat the Missouri Tigers 87-86. Never mind the exciting finish; this may the last time these two teams ever meet. And it's not the only feud ending this season. College sports has now bid farewell to three of its very oldest rivalries. West Virginia-Pittsburgh, Texas-Texas A&M, and Kansas-Missouri — those schools have squared off more than 100 times in football and far more than that in basketball. The three rivalries are so passionate that it was impossible to see their breakups coming just a few years ago. We're at a crossroads in college athletics where the almighty dollar rules the day. The "Border War," as it's called, between Kansas and Missouri, has its roots in what was quite literally a border war in the 1850s. The two schools started playing each other in 1891. Texas and Texas A&M have played 118 times in football — more than half of those matches on Thanksgiving Day. And take the feud between West Virginia and Pittsburgh — dubbed the "Backyard Brawl." The two teams, both of which wear shades of blue and gold, have played each other since 1895. West Virginia alum Jason Neal isn't happy it's ending. "I dread the day when we aren't looking across the way and seeing those players and fans dressed in the other gold and blue," Neal says. "I dread that day." When asked if there was anybody in the Big 12 who might become a new rival for West Virginia, Neal's answer is firm: "No ... there's only one [Pittsburgh]." Why are these rivalries ending? Because greener pastures — aka dollar signs — lured one or both schools away. "We're at a crossroads in college athletics, where the almighty dollar rules the day," says Fran Fraschilla, a former coach who is now a college basketball analyst for ESPN. He says TV networks are one of the biggest factors behind the most recent conference realignments. Here's how it works: Some conferences, such as the Southeastern Conference, are really good at football, so they command more lucrative TV contracts, which in turn means more money for their schools. Others, such as the Big 10, have their own TV network that brings in millions of dollars for its members every year. Fraschilla says that for a school looking for extra cash, the deal is hard to ignore. "You want to be able to have a good seat in a good conference, and because some conferences generate so much revenue, schools are making decisions based primarily on financial implications," he says. In the case of these three rivalries, those schools are Texas A&M, Missouri and both West Virginia and Pittsburgh. And though that might mean a few million more bucks for those athletic departments, Fraschilla says the moves have done permanent damage to the culture of college sports. "[I'm] still going to enjoy my job as a college basketball analyst, and wherever ESPN sends me I'm certainly going to do the best job I can," he says, "but there's going to be a certain flavor missing because we're not going to see some of these storied rivalries anymore." Look at it this way: Next season, instead of the traditional Turkey Day football game between Texas and Texas A&M, the University of Texas Longhorns will meet the Horned Frogs of Texas Christian University (which, itself, has just bolted to the Big 12). It's safe to say that matchup won't have the same luster. And who's going to be Missouri's rival in its new conference, the SEC? South Carolina? Georgia? Pittsburgh is heading to the Atlantic Coast Conference, and it's tough to see too many compelling rivalries there for it, either. Though the reason universities are moving is clear — money — it's still disappointing to see the rivalry let go, says Neal, the West Virginia alum. "You just want to say, 'We deserve to play you. We deserve to say, "Who's better than you?" I want the bragging rights; you want the bragging rights; let's play the game.' "
For the Backyard Brawl between West Virginia and Pittsburgh, at least, that actually seems likely. Both schools' coaches and athletic directors seem receptive to the idea of the two rivals playing again in the future. But for Kansas and Missouri, let's just say the bad blood runs a little too deep. Kansas basketball coach Bill Self didn't mince words after the teams' first matchup this season. "I don't feel bad. Missouri wanted this," he said. "So why should I feel bad? I don't feel bad for anybody." And on Saturday afternoon, the final buzzer sounded on the Border War. With the conference title on the line, both teams saved their best for last. There's a chance the two will face each other in postseason tournaments to come, but never again as conference rivals, never again on their home courts, never again like this. The audio of this story, as did a previous Web version, misidentifies West Virginia alum Jason Neal as Jason Keal.